Hero Histories: The FIRST SuperHero Archer--The Arrow! First appearing in Funny Pages V2N10, The Arrow was US Intelligence Agent Ralph Payne, who feeling constrained by government rules and regulations, decided to use his archery skills to deal with lawbreakers who otherwise would get away with crimes! He wore either a red or blue hooded costume without a mask (which color depended on what worked better with the cover's color scheme) , though artists would hide his face with shadows or angle him so his face wouldn't show to the reader. 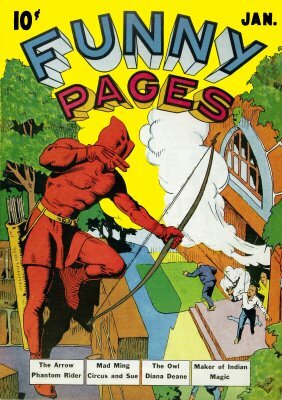 Besides alternating cover appearances (and the lead spot) with other heroes in Funny Pages, The Arrow also had his own title for three issues! Atomic Kommie Comics™ has returned him to the pop culture scene in a new line of collectibles featuring three of his best covers both from Funny Pages (including his first cover appearance) and his own short-lived title. Head over to Lost Heroes of the Golden Age of Comics™ to see him and all the other characters who Alex Ross has revived for a modern-day audience in the amazing Project SuperPowers comic! (In fact issue #5 cover-features both The Arrow and The Target & Targeteers together! Hmmm, an archer and three guys with bulls-eyes on their chests! As we always say, BUY Project SuperPowers ! It's well worth your hard-earned cash!